Gun-toting FBI agents sneaked up on former Trump adviser Roger Stone in the morning hours and arrested him in the spotlight of the cameras. It was a thrilling show, but the fact the FBI did it for free impressed Twitter the most. The arrest is just the latest development in the ‘Russiagate’ saga – the ongoing probe by FBI Special Counsel Robert Mueller into alleged collusion between Trump and Russia during his election campaign. 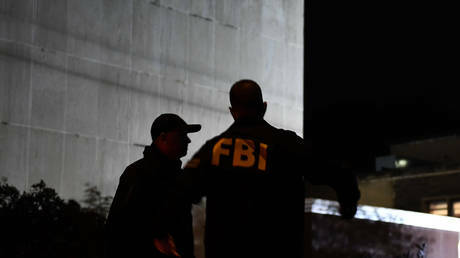 Stone’s arrest was quite a show, with FBI agents showing up at his door in numbers, body armor-clad and packed with heavy weaponry, as if they were dealing with armed terrorists. The performance was greatly appreciated by the anti-Trump crowd, who took to Twitter to praise the FBI for their work. The fact that they were doing it while unpaid due to the ongoing government shutdown has apparently become the center of joke-filled gratitude. I love Friday cliffhangers. Knock, Knock, FBI: “Warrant, Open the door!” Roger Stone has been arrested! God Bless the FBI..they’re not getting paid but they are doing their jobs, keeping us safe & took this crook down! Another one bites the dust. Mueller Time..
— A♈️AⓂ️™ (@Ava_ABQuteee) 25 января 2019 г. Some Twitter users said the FBI agents must have volunteered to do the job – and wondered how many were actually turned down. The FBI arrested Roger Stone during the shutdown. The agents are not being paid right now. Makes me wonder: were these volunteers, if so how many did they turn away? — Chris Richard (@chris_ag88) 25 января 2019 г. Many believe the FBI agents themselves were actually eager to grab a Trump associate despite not being paid. FBI: Mind if we tip off CNN so the television cameras can film it? — Palmer Report (@PalmerReport) 25 января 2019 г.
I’m sure that the FBI arrested “Roger Stone” with zest because they aren’t getting paid due the #shutdown and the negative remarks that #Trump has made against the #FBI. — James O’Connor (@jarekio) 25 января 2019 г. — Dave Gibson (@MrDaveGibson) 25 января 2019 г. The ongoing government shutdown is already the longest in US history, entering day 35 of the standoff between Trump and the Democrat-controlled Congress over funding for the border wall. Around 800,000 federal workers have been left without pay, although some whose jobs are considered essential, like FBI agents, had to work for free. On Friday, government employees will apparently miss their second paycheck as the standoff continues.